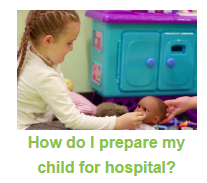 This website features videos clips which aim to prepare parents, carers and children for a positive hospital experience. Each video clip shows what happens during a different hospital procedure, or features advice on a particular topic e.g. ‘How do I prepare my child with a learning disability for using healthcare services?’. There are also colouring pages which depict different stages in the hospital journey, and can be printed and given to children to colour in. As well as informing children and parents about what to expect during a hospital visit, these resources can also reduce their anxiety. ‘What? Why? Children in Hospital’ is a registered charity based in Scotland. The videos were developed in partnership with the Hospital Play Service, Royal Hospital for Children and NHS Greater Glasgow and Clyde.